Donna Schuster was born in Milwaukee, Wisconsin in 1883. She attended the Art Institute of Chicago and the Boston Museum of Fine Arts School studying with Edmund C. Tarbell and Frank W. Benson. She continued her education in art by accompanying William Merritt Chase on a painting tour of Belgium in the summer of 1912. Schuster relocated to Southern California in 1913 and during the following year, she was studying again with William Merritt Chase, the two of them taking a class in Carmel, California. She ended up staying in San Francisco during the Fall of 1914 where she worked on a series of watercolor sketches of the construction of the Panama-Pacific International Exposition. She earned a silver medal for watercolor there, which was shown at the Los Angeles Museum of History, Science and Art in 1914. In the early 1920’s she moved to Los Angeles where she taught at the Otis Art Institute. She built a studio home in Griffith Park, in the Los Angeles area where she remained for the rest of her life. Her wonderful Impressionistic style was most emphasized in her paintings of people, landscapes, still-lifes and cityscapes. Most of her works displayed her recognizable brushwork but after studying with Stanton MacDonald-Wright later in her career, her work took on more Cubist and Abstract Expressionist with his influence. 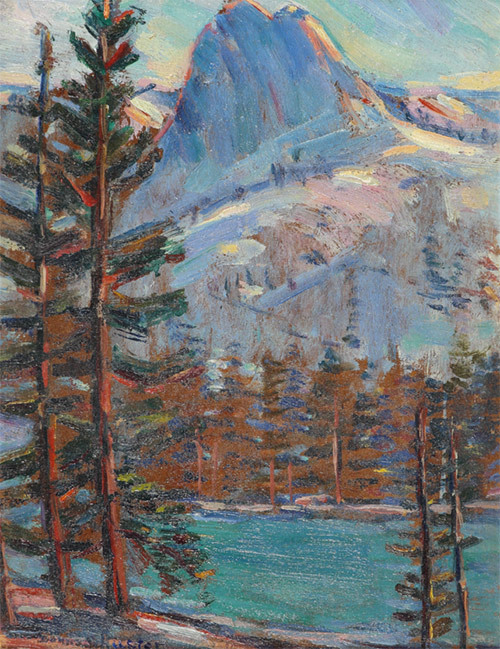 In her early years her art was exhibited at the Los Angeles County Museum of Art in 1914, 1917, 1920, 1927 and 1929. Later, in the 1930’s, she had shows at the San Francisco Art Association, the New York Academy of Fine Art and the New York Water Color Society. She was a founding member of the California Watercolor Society and was involved with their exhibitions from 1921 until the mid 1940’s. In 1953, Schuster died, trapped inside her home as it was destroyed in a brush-fire.